One fascinating part of the “Amazing Grace” story is how the song’s writer, John Newton, ended up campaigning against the very slave trade he’d once helped lead. Newton’s chance to fight slavery came in 1788 when, after years of debate, British Prime Minister William Pitt finally formed a committee to investigate the slave trade. The star witness — and the only man in England who was willing to paint the harrowing details of that practice as an “insider” — was Newton. I should think it rather unsuitable to my present character as a minister of the Gospel to consider the African slave trade merely in a political light… The righteous Lord loveth righteousness, and he has engaged to plead the cause of the oppressed. I ought not to be afraid of offending many, by declaring the truth, if indeed there can be many who plead for a commerce so iniquitous, so cruel, so oppressive, so destructive, as the African Slave Trade! Newton did not just revel in his own position as a man forgiven by God’s grace. He also did something about the “ungrace” toward others he saw in his society. He celebrated his spiritual freedom and also worked for both spiritual and physical freedom for the oppressed, seeing this as part of his calling. It’s intriguing to me that the primary social causes Newton encouraged in his young followers were: making the slave trade illegal; passing laws against cruelty to animals; and reforming manners, including vulgar language. You could say that each of these causes was about bringing grace to situations where “ungrace” prevailed. Notice that the message of grace — the good news of God’s favor — is intertwined with helping the poor. In its original context in Isaiah this verse is part of a section that clearly teaches that we’re to help the poor, the oppressed, the hungry. It’s part of bringing God’s grace to a world that needs it! When you’re set free by grace, you’re not given this gift just so you’ll feel better. You’re called to “live as children of light” (Ephesians 5:8) in a world of darkness. But remember, you don’t do this to prove anything to God. He already loves you unconditionally. As I heard someone say, “I do this not from mere motivation; I do it from inspiration!” The more you understand the grace of God, the more you’ll long to extend that grace in every way. 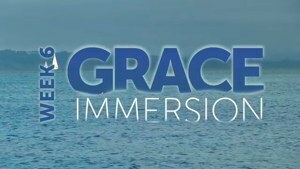 As you saw earlier in this Grace Immersion, the horizontal result of grace follows the vertical reception of grace. How can you help bring grace to part of your world or neighborhood that is “ungraced”? Why is this often hard? Ask God to help you live as a child of light! This means both seeking personal holiness and freeing oppressed and poor people around you.